Finland’s cooperation with Central Asian states is mostly based on development assistance, but diplomatic and economic ties are increasing. Several international and EU development projects have been supported by Finnish funding and expertise. Areas in which Finnish expertise and support have benefited Central Asia include high-quality technology, rule of law, water management and border control. Finland opened its first embassy in Central Asia in 2010, in Astana, and the Kazakhstani embassy in Helsinki was opened in autumn 2012. These diplomatic links match Finland’s wider political role in Central Asia, since Finland has particularly close economic and political relations with Kazakhstan. Trade and diplomatic relations between Finland and the other four Central Asian states remain very limited. However, Finland has given significant development assistance to countries in the region, especially to Kyrgyzstan. The Finnish government has actively participated in human security initiatives, for example, on cross-border conflict management. In this way, Finland continues to build its international reputation as a neutral country that specialises in softer political agendas such as conflict resolution and environmental monitoring. Finland also has a unique role in Central Asia, stemming from its geographic location as Russia’s closest western neighbour, which has given it historical ties to and well-established relations with the post-Soviet space. 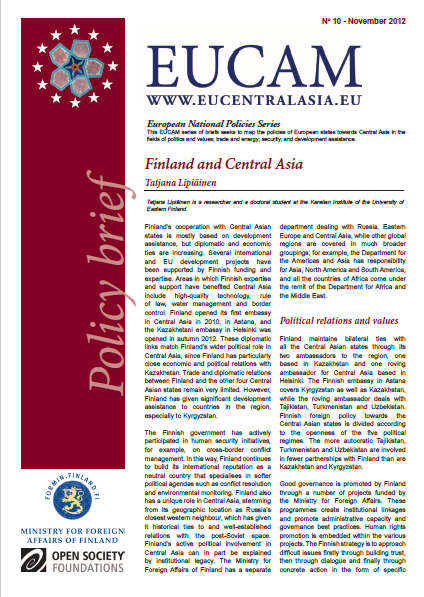 Finland’s active political involvement in Central Asia can in part be explained by institutional legacy. The Ministry for Foreign Affairs of Finland has a separate department dealing with Russia, Eastern Europe and Central Asia, while other global regions are covered in much broader groupings; for example, the Department for the Americas and Asia has responsibility for Asia, North America and South America, and all the countries of Africa come under the remit of the Department for Africa and the Middle East. Finland maintains bilateral ties with all the Central Asian states through its two ambassadors to the region, one based in Kazakhstan and one roving ambassador for Central Asia based in Helsinki. The Finnish embassy in Astana covers Kyrgyzstan as well as Kazakhstan, while the roving ambassador deals with Tajikistan, Turkmenistan and Uzbekistan. 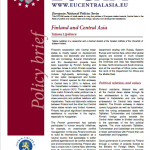 Finnish foreign policy towards the Central Asian states is divided according to the openness of the five political regimes. The more autocratic Tajikistan, Turkmenistan and Uzbekistan are involved in fewer partnerships with Finland than are Kazakhstan and Kyrgyzstan. Good governance is promoted by Finland through a number of projects funded by the Ministry for Foreign Affairs. These programmes create institutional linkages and promote administrative capacity and governance best practices. Human rights promotion is embedded within the various projects. The Finnish strategy is to approach difficult issues firstly through building trust, then through dialogue and finally through concrete action in the form of specific projects. Next to supporting the EU in taking up values, Finnish diplomatic representatives also raise concerns over democracy and human right matters in bilateral meetings they have with Central Asian counterparts. Frequent high-level bilateral meetings are held between Finnish and Central Asian representatives. For example, the president of Tajikistan, Emomalii Rahmon, visited Finland in October 2012 and met the Finnish president, Sauli Niinistö, and the Finnish prime minister, Jyrki Katainen. In spring 2012, Finland’s minister of education held a bilateral meeting with his Kazakhstani counterpart and the foreign minister of Tajikistan, Hamrokhon Zarifi, met with the Finnish ambassador to Tajikistan, Turkmenistan and Uzbekistan, Tuula Yrjölä. In August 2012, the ministry of foreign affairs of Uzbekistan held a meeting with the Finnish Special Representative of the Minister for Foreign Affairs. Finnish Minister for European Affairs and Foreign Trade Alexander Stubb visited Kazakhstan along with a large business delegation in October 2012. The foreign ministers of both Kazakhstan and Kyrgyzstan are planning to come to Finland at the beginning of 2013. Finnish companies are not directly involved in the core of the oil production industry in Kazakhstan. But Finnish companies such as Outotec and Metso provide equipment and technology for Kazakhstani metallurgical and mining companies. Telecommunications corporation TeliaSonera has been a pioneer in Kazakhstan; it has been operating there for 15 years and has made very large investments in the country. Nokia also has a presence that extends beyond the telecommunications sector, exporting winter tires to Kazakhstan. Overall, Finnish companies have invested significantly in the technological development of Kazakhstan. Because President Nursultan Nazarbayev is trying to diversify the Kazakhstani economy, interest in Finnish innovation, for example in education systems, is growing; opportunities for Finnish clean-tech companies are increasing as well. (4) However, Finnish companies often have to compete with Russian, Turkish and South Korean firms, who can offer cheaper prices for their products and services. Trade between Finland and the other Central Asian states has been very limited. Few Finnish companies have operations in Kyrgyzstan, Tajikistan, Turkmenistan or Uzbekistan. The small number of companies that are present, such as Nokia, mainly operate in the telecommunications sector. In Turkmenistan, some Finnish companies provide technical expertise in the gas extraction industry. Finnish goods are sold in Central Asia, but due to the global reach of Finnish companies and the representation of Finnish goods by firms from other countries, it is difficult to determine the actual extent of penetration of Finnish goods into the markets of Kyrgyzstan, Tajikistan, Turkmenistan and Uzbekistan. Finland supports all market-based interconnections between energy-producing countries and the EU. So, it supports the Nabucco project as well as the Trans-Caspian gas pipeline. The two are seen as being closely connected to each other. Together, they would bring considerable amounts of gas to Europe, diversifying sources of supply and thereby increasing the energy security of the EU. (5) Nevertheless, Finland is mindful of the environmental concerns that accompany the building of a pipeline through the Caspian Sea. From a purely Finnish perspective, the Nabucco pipeline will not have a direct impact on Finland in the same way that it will affect more southern parts of Europe. For this reason, Finland is not operationally involved in the Nabucco project. Finland’s Defence Strategy 2025 focuses on globalisation and the interdependence of global security risks. Finland sees its role in Central Asia as that of a competent international crisis management actor. Although Finland is not a NATO member, the strategy says, ‘Through developing partnership activities with NATO Finland can more effectively participate in exercises and NATO-led crisis management operations.’(7) The Finnish ambassador to Kazakhstan and Kyrgyzstan, Mikko Kinnunen, sees the NATO withdrawal from Afghanistan in 2014 as a major external threat to Central Asia. The NATO withdrawal may further aggravate already existing security challenges in Central Asia, which range from water and land management issues to the rise of extremism. At the same time, the ambassador stresses that many critical security threats have their roots within the Central Asian states themselves. Internal threats, he thinks, pose an even greater risk to the five states than does the withdrawal of troops from Afghanistan. (8) Consequently, Finland has been active in helping to manage softer security threats. Special attention has been paid to programmes that involve ensuring water and food security as well as preventing conflicts through peaceful means. (9) Talks are currently underway between Finland and Kyrgyzstan on sharing Finnish experience in peacekeeping so as to create and train a Kyrgyz peacekeeping unit. The Finnish government has assisted the UN-initiated Central Asian Regional and Information Coordination Centre (CARICC) in its fight against drug trafficking, a problem that presents human security risks for the EU space. Finland has donated $1 million to the centre and currently acts as an observer to the project. Although Finland is geographically distant from the region, only Russia lies between the Finnish borders and those of Central Asia. Finland actively supports the OSCE’s border control programmes. For example, Finland has given financial support to the OSCE Border Management Staff College (BMSC) in Dushanbe, Tajikistan, which was launched in May 2009. The Tampere Peace Research Institute (TAPRI), part of the University of Tampere, has contributed to the college’s efforts through expertise sharing. (10) Finnish border guards are also planning to export technological innovations to Kazakhstan to assist in monitoring the country’s extensive borders. Since all the Central Asian countries participate in the OSCE, Finland views the five states as part of ‘our security community’ to which ‘we have an obligation’. (11) So, when ethnic violence broke out in Kyrgyzstan in 2010, Finland provided €1.2 million in humanitarian assistance to the country through the Finnish Red Cross. (12) Many Finnish development projects in Central Asia focus on preventing this kind of conflict from breaking out in the future. In 2011, Finland-Kyrgyzstan relations were put under stress by the incorrect perception that the Finnish government was responsible for the controversial Kyrgyzstan Inquiry Commission report, which assessed the conflict of 2010. But the misunderstanding has had no long-term negative effect on relations between the two countries. Finland strives to promote the rule of law, good governance and human rights through its development projects. One major initiative is the ‘Equal Before the Law: Access to Justice’ project. It involves a 30-month programme jointly carried out with the Eurasia Foundation, which is designed to increase access to justice for vulnerable populations in Central Asia under the social sustainability priority of Finland’s Wider Europe Initiative. The programme focuses particularly on rural women, at-risk children and people with disabilities. (17) Frequently, development programmes of this kind are implemented by international organisations such as the UNDP or other agencies. Although the Finnish government often initiates specific projects according to its development policy priorities, it rarely deploys Finnish experts on the ground to implement the projects. The Finland- Kyrgyzstan Lung Health Programme was one exception, since it operated on a bilateral basis. The programme aimed to support the health care system of Kyrgyzstan in combating TB and other respiratory diseases. (18) Finnish and Central Asian experts view the programme as a positive example of successful development cooperation. Finnish NGOs are not engaged in Central Asia, although a disproportionately high number of Finnish citizens work for international agencies. Along with the previously mentioned universities of Tampere and Aalto, the University of Eastern Finland also has a number of university exchange agreements with institutions in Kazakhstan, Kyrgyzstan and Tajikistan. Until recently, there has been little Finnish research engagement in Central Asia, but the Wider Europe Initiative has led to a rise in Finnish interest and expertise on the topic. Under the WEI programme, EUCAM has also sought to increase Finnish research on Central Asia and to promote broader European approaches towards the region. Finland has the advantage of being known in Central Asian as a country that has no direct or vested interests, and it has a good reputation in spheres such as knowledge transfer, innovation policy and technology. This gives Finland an excellent basis to build on so as to find specific sectors in which it can provide expertise that is relevant to Central Asian countries. In the future, Finland will most likely focus on cooperation under the headings of the green economy and sustainable management of natural resources. Rule of law is an important area, and the Finnish government expects to continue developing the cooperation that has already begun well, placing particular emphasis on empowering the most vulnerable groups in society. Transmitting Finnish best practices, which include transparency, respect for the rule of law and administrative efficiency, forms an important part of Finland’s contribution in all the sectors in which it is active. All these practices are linked to the fight against corruption, which Finland considers to be a key problem in the Central Asian region. Finland plays a different role in each of the five Central Asia states, depending on the concrete opportunities offered by the partner countries as well as on the Finnish government’s priorities for the region. Finnish diplomats realise that Central Asia may lose some of its strategic significance once Western troops withdraw from Afghanistan. Future development assistance to the region is also likely to decrease due to the on-going economic difficulties in Europe. Even though ties are improving, particularly between Finland and Kazakhstan, future links with Central Asia are heavily dependent on the wider regional and global economic and security context. Finnish Prime Minister’s Office, ‘The objective for Finland’s EU Presidency: a transparent and effective Union’, eu2006.fi, 30 June 2006, http://www.eu2006.fi/NEWS_AND_DOCUMENTS/PRESS_RELEASES/VKO26_/EN_GB/162650/INDEX.HTM, accessed 16 October 2012. See Ministry for Foreign Affairs of Finland, ‘Wider Europe Initiative – Implementation Plan for 2009-2013’,Formin.Finland.fi, 14 July 2009,http://formin.finland.fi/public/default.aspx?contentid=167831&nodeid=15457&contentlan=2&culture=en-US, accessed 12 September 2012. Embassy of Finland in Astana, ‘Trade relations’, Ministry for Foreign Affairs of Finland, 20 July 2010,http://www.finland.org.kz/public/default.aspx?nodeid=42517&contentlan=1&culture=fi-FI, accessed 7 September 2012. Interview with Ambassador Mikko Kinnunen by Tatjana Lipiainen, 19 September 2012. Interview with Ambassador Tuula Yrjölä by Tatjana Lipiainen, 18 September 2012. Ministry of Defence, ‘Securely into the Future – Ministry of Defence Strategy 2025’, p.13,http://www.defmin.fi/files/674/Securely_into_the_future_-_strategy_2025.pdf, accessed 10 September 2012. M. Kinnunen, ‘Nordic experiences of discovering the New Continent of Central Asia’, Estonian Ministry of Foreign Affairs, http://www.vm.ee/?q=en/node/13744, accessed 13 September 2012. Ministry for Foreign Affairs of Finland, ‘Finland deepens relations with Eastern Europe, the South Caucasus and Central Asia’, Formin.Finland.fi, 31 January 2010, http://formin.finland.fi/public/default.aspx?contentid=185263&nodeid=32278&contentlan=2&culture=en-US, accessed 10 September 2012. OSCE Border Management Staff College, ‘What is the BMC?’, OSCE, http://www.osce.org/tajikistan/92362, accessed 13 September 2012. Permanent Mission of Finland to the OSCE, ‘Finland grants humanitarian aid to Kyrgyzstan’, Ministry for Foreign Affairs of Finland, 16 June 2010, http://www.finlandosce.org/Public/default.aspx?contentid=194900&nodeid=38328&contentlan=2&culture=en-US, accessed 5 September 2012. Ministry for Foreign Affairs of Finland, ‘Wider Europe Initiative – Implementation Plan for 2009-2013’,Formin.Finland.fi, 14 July 2009,http://formin.finland.fi/public/default.aspx?contentid=167831&nodeid=15457&contentlan=2&culture=en-US, accessed 12 September 2012. See Ministry for Foreign Affairs of Finland, ‘Finland’s Development Policy Programme 2012’, Formin.Finland.fi, 19 June 2012, http://formin.finland.fi/public/default.aspx?contentid=251855&culture=en-US,accessed 17 September 2012. Ministry for Foreign Affairs of Finland, ‘Finland´s Development Cooperation in Central Asia and South Caucasus’, Formin.Finland.fi, 15 April 2012, p. 28, http://formin.finland.fi/public/default.aspx?contentid=158693&nodeid=15454&contentlan=2&culture=en-US, accessed 13 September 2012. Equal Before the Law,‘ Program Summary’, http://equalbeforethelaw.org/about-ebl/program-summary, accessed 19 September 2012. Ministry for Foreign Affairs of Finland, ‘Kyrgyzstan-Finland Lung Health Programme’, Formin.Finland.fi, 24 June 2002, http://formin.finland.fi/public/default.aspx?contentid=46557&nodeid=15317&contentlan=1&culture=fi-FI, accessed 5 September 2012. See Water & Development Research Group, ‘Central Asian Waters’, http://www.wdrg.fi/research/central-asian-waters/, accessed 19 October 2012.